A range of three high quality 80mm objective lens binoculars designed specifically for outdoor use, the WP Observation series are fully nitrogen waterproof and can be used in the rain or left unprotected on a tripod during showers without the worry of water penetration.. 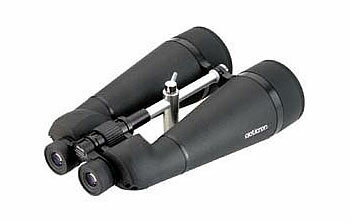 Featuring a high specification fully multi-coated porro prism optical system, the clarity and field of view derived from the 16x80 makes it an excellent choice for astronomy, while the higher magnification 20x80 and 30x80 are geared more toward long range terrestrial observation and specialist outdoor applications such as aircraft observation. All three models provide long eyerelief and deliver full field of view with or without spectacles. Used either as hand held instruments supported using the 31018 Harness, or using a standard photo/video tripod connected to the integral tripod adapter, the WP Observation are among the very best large objective field binoculars available on the market today. Models supplied in hard carry case with 30 year guarantee.